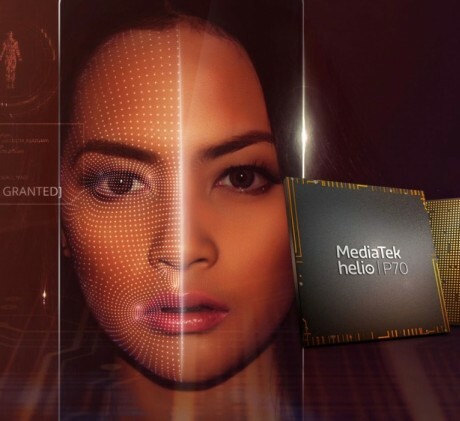 MediaTek today announced the Helio P70, a refreshed system-on-a-chip that goes head-to-head with Qualcomm's Snapdragon 600 and 700 series for sub-flagship devices. The Helio P70 is based on a 64-bit, octa-core CPU built from ARM Cortex A73 and A53 cores with clock speeds up to 2.1 GHz. It is paired with a 900 MHz Mali-G72 GPU and supports up to 8 GB of LPDDR4 RAM. Together, these boost speeds 13% and power efficiency 15% when compared to the P60. The processor can support full HD+ displays with aspect ratios up to 20:9. The P70 includes a 525 MHz multi-core AI Processor Unit that MediaTek says delivers 10% to 30% more AI processing efficiency. This comes into play with the camera capabilities, which allow for a 3x improvement in depth-mapping, smoother bokeh previews, EIS, facial detection, scene detection, and anti-blooming engine (to prevent whiteouts), all while saving power. The P70 also supports real-time HDR processing for photos and videos, and can save RAW HDR images. The processor can handle a 32-megapixel single camera, or a 24- and 16-megapixel paired camera combo. MediaTek says the P70 delivers better gaming performance, dropping power usage by 35% when compared to the P60. On the connectivity front, the P70 supports dual-SIM phones with VoLTE/ViLTE; Cat 7 LTE with two-channel carrier aggregation; and Bluetooth 4.2, WiFi, GPS, GLONASS, and FM radios. The Helio P70 is in volume production now, and is expected to be available in consumer devices as soon as November.